Maybe most New Yorkers would rather hunker down in their brownstones and eat bagels, perhaps with plenty of booze, while the winter storm ravages the city. But the city is getting younger all the time, and no amount of cold-snap adversity can stop a determined urban snowboarder from finding a way to capitalize on the slick and powdery maze that the city’s grid system has become. And no, ‘slick and powdery maze is not a nickname for the infamous New York club, Studio 54. It’s just our way of describing winter fun in the city. 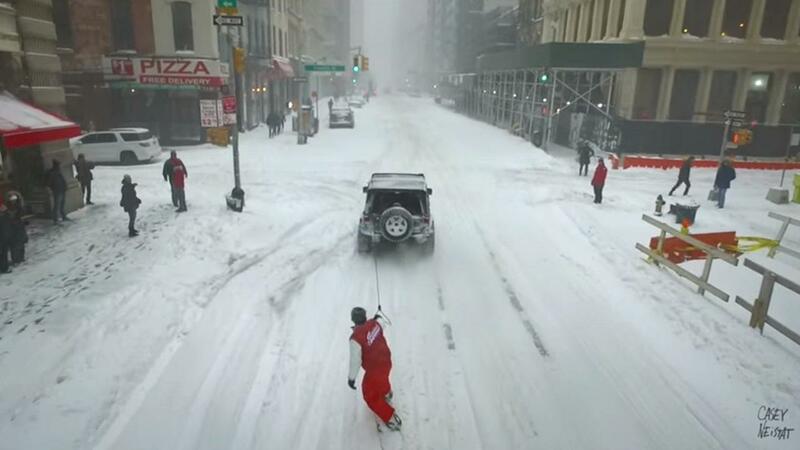 So while many stayed in, this guy went out, suited up with his board and armed with a camera, to bomb through the streets on the fresh powder that otherwise makes for news reports of paralyzed airports and unprepared drivers. Of course, there are no hills in New York City, but there are cars and tow ropes. Such a combination has always made for proper and ill-advised applications of both physics and risk taking. But why should anyone ignore the opportunity to turn The Big Apple into a snow and motor ice pinball extravaganza? And what could be better than getting New York’s finest involved in the good times?